“I could not say this on December 14, because, to be honest, I could not face admitting it to myself. The fact is I bear some responsibility for the slaughter of 20 children and seven adults in Newtown, Connecticut. I bear this responsibility because, in the past four years, I have done nothing to address the madness which has been spawned by our Second Amendment. “I could tell you that I held off because I wanted to fix our health care system and I hoped some sane Republicans might join me in that cause. And I could tell you that once some of the least sane Republicans anyone will ever meet took control of the House of Representatives after the 2010 mid-terms, I did not see any point in proposing gun control measures which were destined to fail. Certainly I tell myself these things, but you and I know I could and should have done something. “What I would like to do is repeal the Second Amendment. “Let’s get serious. It was written when there was no law enforcement, other than a surprisingly successful, but nonetheless ragtag army – and protecting citizens wasn’t its job. 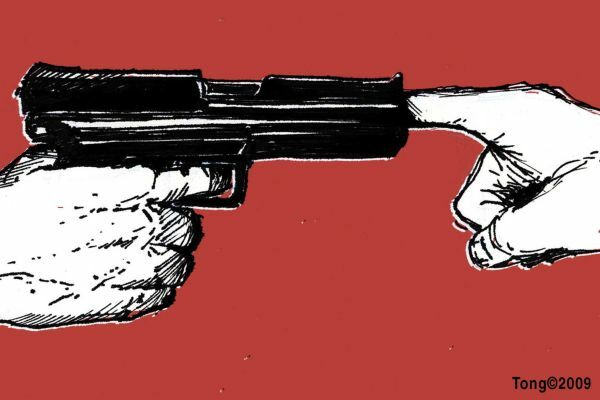 Why on earth should anyone have the right to bear arms? You want to go out to shoot a moose or a deer to feed your family, fine. But you don’t need an AK-47 for that. “Unfortunately, repealing the Second Amendment is going to take a lot longer than we’ve got. “So, here’s what we’re going to do instead. “Tomorrow I am going to put forward legislation which will ban outright the sale of all firearms except pistols for target practice and hunting rifles. It will also ban over-the-counter sales of any firearms. All firearms must be registered and to acquire a firearm you will have to apply for a permit. “The minimum waiting period for a permit will be one month. If you’ve got a problem so bad that you need a firearm immediately, then you need to go and talk to the police. “All the people who currently own legally-purchased firearms of any description will get to keep them. However, those firearms will need to be registered and that registration will have to be renewed annually at a police station where gun owners will be required to produce the registered weapons as proof that they still own them. There will be a six month grace period to allow owners of legally-purchased firearms to complete the registration process. After that six-month period, all unregistered firearms will be considered illegal weapons. The weapons will be confiscated and the owners will go to jail. “Should gun owners – in the aftermath of Newtown and all the other gun-related carnage in this country – decide that, on reflection, they do not actually need or want their own private armoury (or that they just can’t be bothered spending the time and money required to register all their weapons), there will be a no-questions-asked amnesty. Simply go to your nearest police station and hand over your weapons. If you still have proof of purchase, you will be issued a tax receipt for the value of that gun. “And if I hear one more gun nut say that guns don’t kill people, I swear I’m going to make that statement illegal and liable for imprisonment, too. And, yes, I did just call you a nut, gun-crazy guy, because only a nut would make that claim. “If you think there isn’t a hope in hell of this legislation passing, you’re wrong. If you want this madness to end, then you need to call your congressman and senator and you need to tell them that if they don’t vote to pass this legislation, you will not vote for them again. Trust me, they actually do need your votes more than they need campaign contributions from the NRA. “And even if the legislation fails, even if the gun lobby wins again, then at least you and I will be able to take some small comfort in knowing that we tried.